Forget all you know about the Egyptian Revolution. There is another revolution in progress, that has had some visible signs in last week’s clashes in Khoussus and then the funeral ceremony at St. Mark Cathedral that left 7 people dead. Blame the Brotherhood, as many Copts and opposition parties do without having any evidence and forgetting that the Egyptian state has officially discriminated against non-Sunni citizens whether they are Shi’ite, Copts, Armenians or Bahais. Yet, what Coptic activists have done by rejecting the proposal that they should have their religious beliefs written on their ID cards is revolutionary. This is resistance by any means and might revolutionize state-citizen relationship in terms of religious freedom and rights. 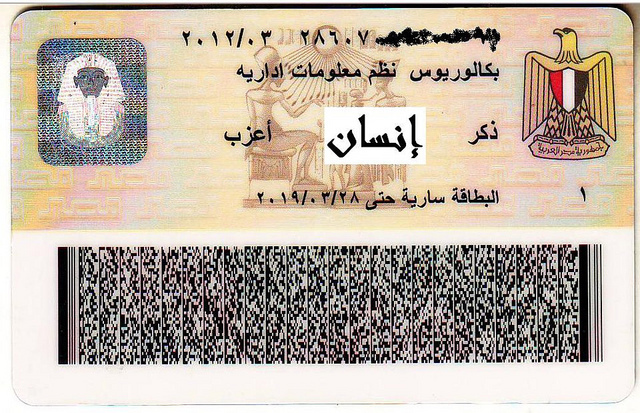 Every Egyptian’s religion is recorded when a citizen applies for an ID card. Indeed, this undemocratic practice is the reason why Bahais are denied citizenship, as they do not belong to an Abrahamic religion. This procedure enables state power to penetrate every part of the citizen’s private life: for example, Bahais cannot marry Egyptians. For years, citizens criticized this practice of the state, but to no avail. Yet, it seems the None of Your Businesscampaign has found remarkable support among ordinary people, although some still argue that such a campaign is against religion. Many Egyptians have shared pictures of their IDs either by scoring the religious belief section out or covering that section. If managed and propagated wisely, this nonviolent form of resistance might produce important results. Yet, the question is – is the state willing to give up part of its armoury of control? This is where things get complicated. Neither the Egyptian state nor the Muslim Brotherhood’s Freedom and Justice Party would like to see such a change. The newly adopted Egyptian Constitution states that the main source of legislation is Islamic law. How can the state reconcile its relationship with its non-Muslim citizens if the state itself has such a strong pro-Islamic stance? Clearly, there is no way that Egypt is going to change its character any time soon. Yet, the state could both be Islamic and based upon universal human rights, creating an inclusive governance system. Skeptics would argue that Islam and human rights cannot coexist, but Islam gives important space to democratic institutions, human dignity and equality. The issue, however, is not one-way, given the religious institutions’ stance on personal status law and civil marriage. Both Al-Azhar and the Coptic Orthodox Church have a long history of an orthodox stance on these fronts which they will not give up easily. Despite Pope Tawadros II’s recent policy changes towards church-state relations and justified demands for a new social contract, the Church might not support the None of Your Business campaign. In the eventuality that this campaign does not receive the support of the majority of Egyptians, however, the resistance might kindle further assertive sectarianism that would contribute to the instability of the country. The Egyptian political system is prone to such a threat if resistance proves futile. Yet, the Egyptian Revolution in the making has been a product of hope and has given hope to millions of people. This is exactly why we need to believe in such resistance movements, although it might take time to succeed. The revolution continues.